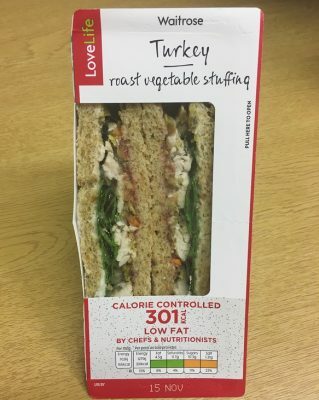 So far we have had the Boots Shapers and Waitrose Love Life Sarnies but festive sarnies are not just confined to in-between two bits of bread. 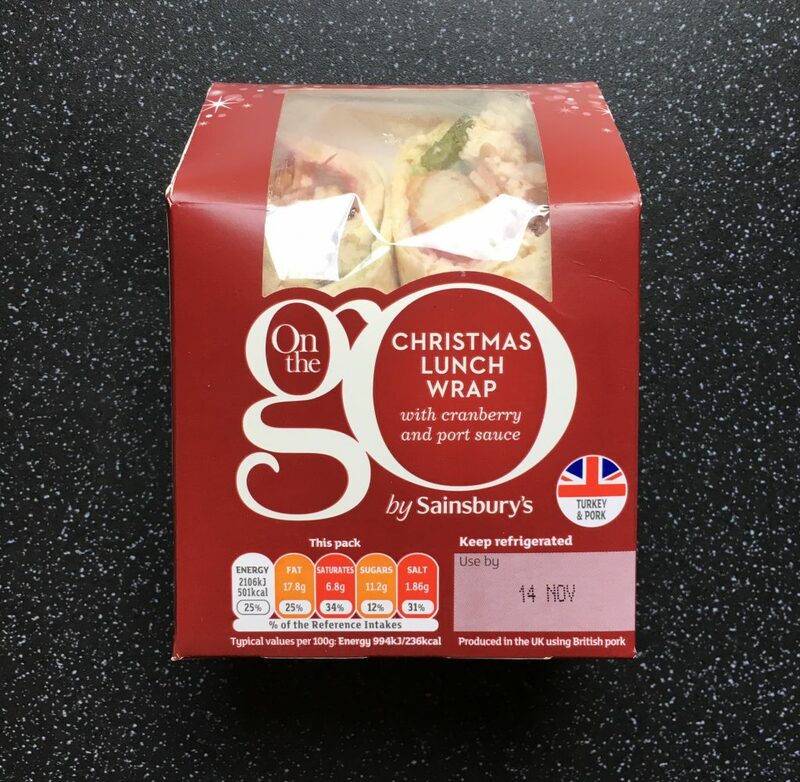 Oh no sir bob, Sainsbury’s Christmas Day Lunch has broken the festive sarnie boundaries and given us a Christmas Lunch in a tortilla wrap. Mind blowing I’m sure. Costing a pretty reasonable £2.20, even the description of this makes it hard to believe they can fit all that into a tortilla wrap. I am all for challenging the conventional however my slight reservation of a store bought filled wrap is they are often exceptionally dry. 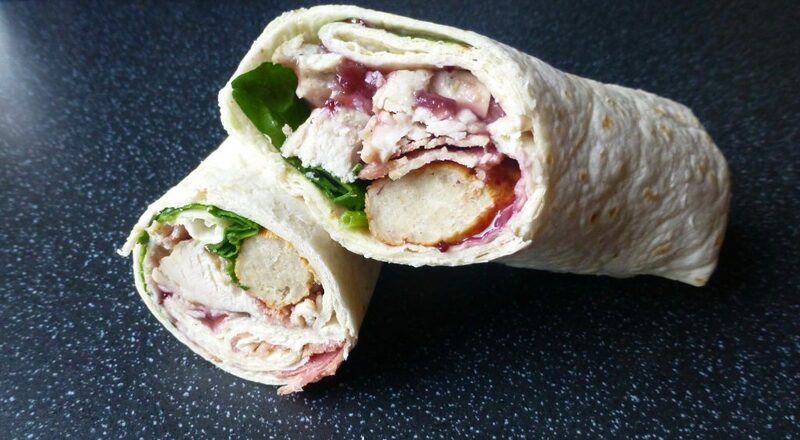 Steam roasted British turkey with sage, onion and apricot, British pork cocktail sausage, cranberry and port sauce, maple cured bacon and spinach in a tortilla wrap. Per pack: 501 kcal, 6.8g sat fat, 11.2g sugar, 25.2g protein. Well those innards look gloriously inviting don’t they. The wrap as a whole was very meaty. This isn’t a bad thing, a meaty good should taste meaty, however the pork from the sausage, stuffing and bacon meant that the turkey was trampled on and barely detectable. The cranberry and port sauce was thick, sweet and a little tart, however mostly concentrated at the top of the wrap. The turkey itself was pretty dry which did not aid the wrap situation. As expected this wrap was as dry as ever, especially once you hit a couple of bites in it got pretty hard going. The spinach thankfully isn’t too in your face but I would rather they got rid of it all together. It has the Christmas elements just hasn’t been executed as well as it could have been. The Sainsbury’s Christmas Day Lunch has it all there but there is one fundamental problem. The wrap. 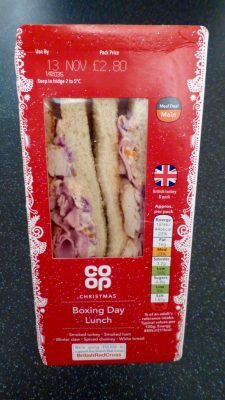 A festive sarnie should be exactly that, a hell of a load of christmas goodness from start to finish, sandwiched between two bits of soft fresh bread. If Sainsbury’s just transferred their filling over to the bread they would be looking at a winner. A good effort Sainsbury’s, just not good enough. I was pretty shocked as well, especially for a wrap.